As a contemporary example of Iranian architecture, the design of Tehran's Museum of Contemporary Art has been inspired by certain traditional Iranian as well as modern architecture. This architectural style is inspired by the wind-towers of Iran and was designed by the Iranian architect Kamran Diba. It is built in three floors and has been used as a permanent exhibition since 1977. 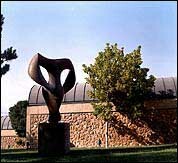 The Museum has nine galleries, three of which are dedicated to paintings by international artists from the museum's permanent collection. The permanent collection contains paintings from artists such as Claude Monet, Vincent van Gogh, Pablo Picasso, Ren� Magritte, Andy Warhol and many more. Temporary exhibitions are held in the other six galleries throughout the year.